I flew 61.8 hours, 9.6 of which were at night. 37.8 hours were cross-country flights (i.e., distances of more than 50 NM), and 14.8 of those cross-country hours were by myself. I carried 16 passengers (plus my dawg). I visited 16 new airports. Jodie flew with me for 14.3 hours, nearly a quarter of my flying time! I've flown on 3 business trips, 4 overnight trips, and 2 weekends away with Jodie. 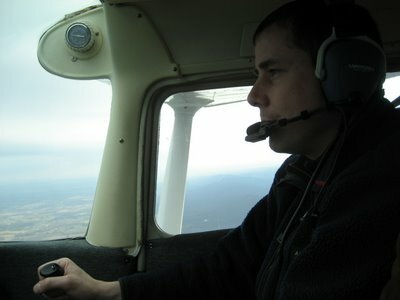 As an AOPA Project Pilot Mentor, two of my mentees have soloed and are on track to become pilots this summer. My old friend Ryan and I shared a love of motorcycles when we were younger, so it was only natural that he would have had the same life-long love of airplanes that I've had. 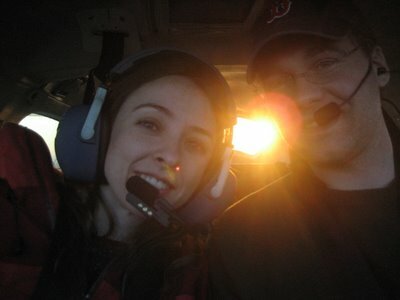 It took a year, but he and I finally went flying this month when he and Rachael came to visit. The four of us set out to go to Luray Airport, where we were going to take a shuttle to Luray Caverns. The weather was iffy, and we almost didn't go, but after hanging around the airport cafe at Gaithersburg, the weather reports were finally showing that we could make it. Cloud ceilings were about 2,500 feet above the ground over most of the area and we could stay in valleys all the way to Luray. Although Luray is among the mountains, we didn't have to cross any big mountains to get there. There were scattered showers and temperatures aloft were just above freezing, but it was warm and dry in the plane and our flight toward Luray was smooth. We flew over Harper's Ferry, then headed southwest down the Shenandoah Valley. The visibility was poor. When we were several miles south of Winchester, Ryan and I looked ahead and saw an opaque gray sheet a few miles ahead -- it looked like a wall of slate, running from the clouds all the way to the ground. It could have been rain, snow or who knows, but there was no way I was going to fly into it. With muttered apologies, I banked us into a u-turn and we landed at Winchester to see what there was to see. A half hour later the four of us were spread out inside a huge Crown Victoria ramp car, a former police car that the FBO let us borrow to look around Winchester. We saw a dirt oval track with cars racing on it and walked around a cobblestoned downtown, then returned to the airport for our flight home. There was a gusting crosswind on takeoff, but once aloft, the flight was smooth. Ryan took the controls (his first time) and flew us all the way into the traffic pattern at Gaithersburg. He's a natural. Although I wished for better weather and more time to fly with Ryan, it was a fitting end to my first year as a pilot to be flying with him. One thing I didn't do during my first year was spend a lot of time practicing landings. My landings are generally good, and I have frequent "greasers," where you almost don't feel the touchdown, but I haven't spent time just practicing. My flights usually have one landing at the end of each flight. To illustrate -- I noted above that I made 75 landings during the 61.8 hours of my first year as a pilot. Well, in the one year before I got my license, when I was a student pilot, I made 148 landings in only 51.4 hours. So on Saturday I went and practiced landings. I flew the old routes from my time as a student pilot -- to Frederick, then to Carroll County, then home. I made several landings at Carroll County, and it was very good practice. Sunday was also a treat, as I went and flew with an attorney from my firm who is also a pilot. He flies a Cirrus SR20, which I cannot wait to fly someday. His plane has been in the shop for a couple months following some damage from a metal hook that was lying around on the ground at the airport and got picked up by his propeller, so he hasn't been able to fly. We have been talking for months about going flying together, so this morning I flew across the Chesapeake Bay to Easton, picked him up, then we flew down to Cambridge for breakfast. We had a good time. Jeff is an excellent pilot. He took the controls for a while and had the feel of the Cardinal within a minute or two as he drew circles in the air. After breakfast, he offered to show me Ridgely Airpark in Ridgely, Maryland, so we flew up there. 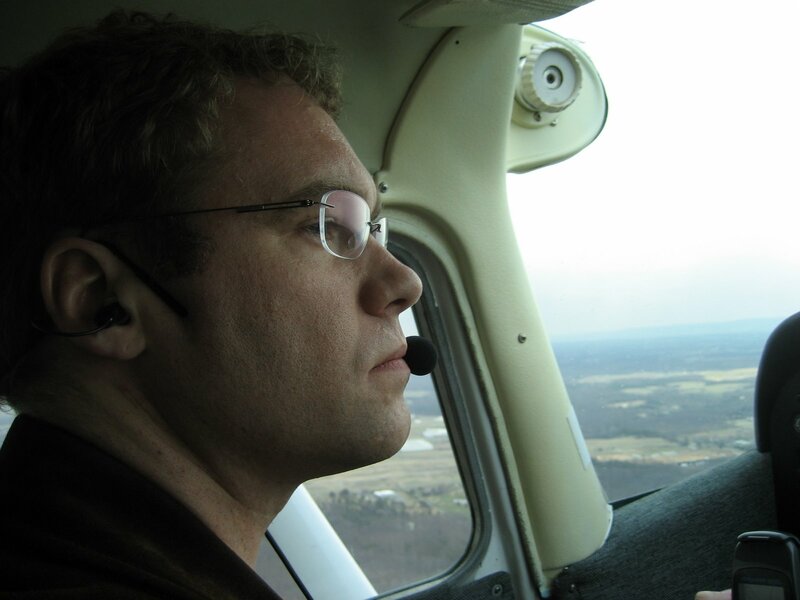 I did a couple landings at Ridgely for the practice of it, then I flew him back to Easton and headed west toward home. From this graphic, you might draw the conclusion that I was flying in circles over a large body of water. It's true. It took a while for air traffic control to recognize my transponder, and I couldn't proceed home until they did see it. It was a waste of gas and time, but at least the Chesapeake Bay was gorgeous. I practiced holding my altitude exactly and enjoyed feeling the burble of my own wake as I circled through it each time. March Madness. I flew 3.5 hours Sunday, for a total of 16.5 in the month of March. That's a lot of flying, and it included a business trip, a weekend away with Jodie, and a lot of good flying with friends, all in one month. This is what it's all about, and I'm really looking forward to the year to come. Two weeks ago, Jodie and I demonstrated the utility of flying on a trip down to Virginia Beach. Jodie is a runner. For the last few years, she and a friend who also enjoys running have moved from job to job together. This year, Jodie, Meg, and Nick, Meg's husband, decided to run a half marathon (13.1 miles) together in Virginia Beach on St. Patrick's Day weekend. 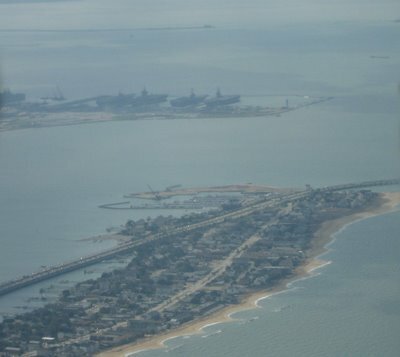 Virginia Beach is southeast of Hampton, where I've driven and flown to recently for work. The closest airport is Norfolk International Airport, which is serviced by Southwest Airlines, Continental, and several others. We landed ahead of a Southwest 737. While we taxied the plane to parking, we called for a . . . taxi. Jodie and I arrived at the hotel, had some lunch, and waited for Nick and Meg to arrive. They had begun the drive earlier in the day, but traffic made their trip about five hours long. Ugh. I've made that same drive with similar problems, so I can sympathize. Jodie ran the race early Sunday morning and finished with a great time of 1 hour, 52 minutes, 12 seconds, her personal best so far. We had lunch with Nick and Meg, got a late checkout, and were dropped at the airport around 1pm. The morning had been cold, rainy, and windy. 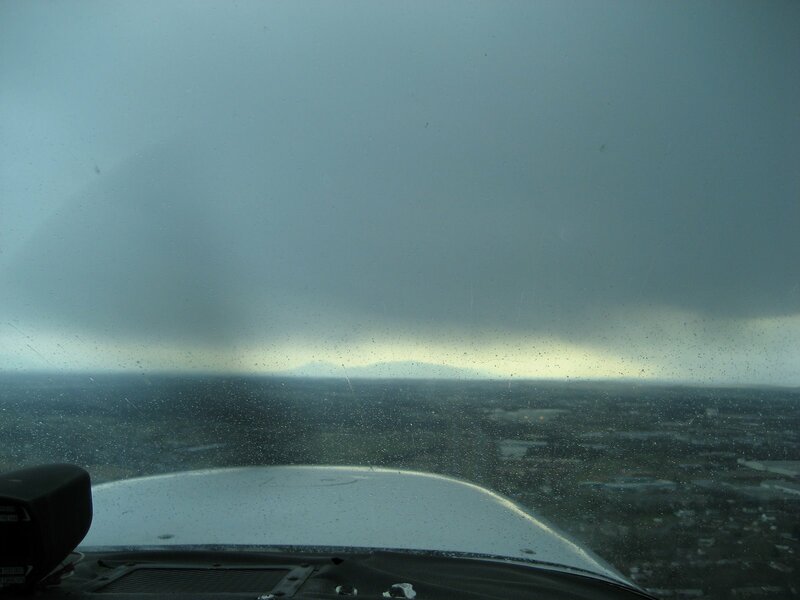 While the rain had gone away, it was still windy and the clouds were low, so Jodie and I sat around in the plush leather pilot's lounge and waited for the clouds to lift as forecast. 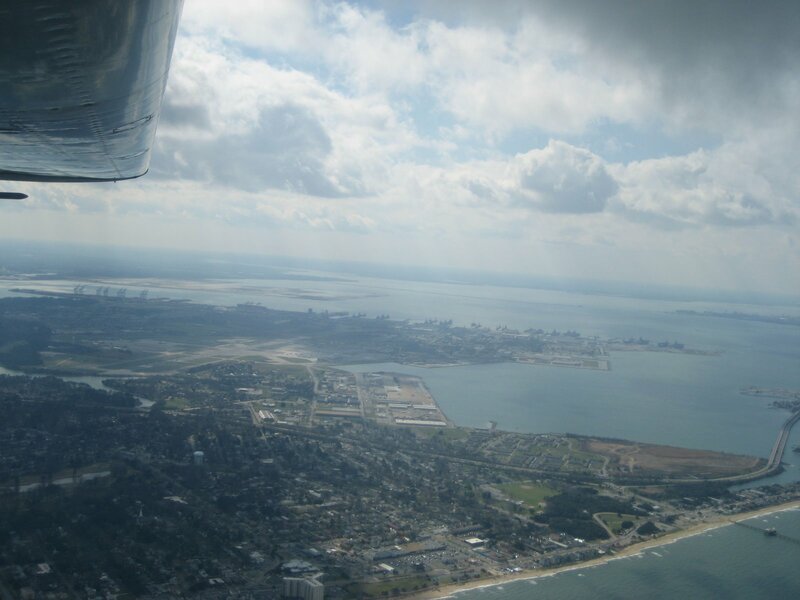 We took off around 3 and headed north, taking note of the naval base and aircraft carriers off our left. A stiff headwind increased as we headed north. About halfway home, there was a sudden jolt of turbulence. Between there and home, the ride was bumpy. The lack of a smooth ride didn't prevent us from picking out beautiful places to live along the Chesapeake Bay, though. When we got close to Gaithersburg, I listened to the weather report. The first time I listened, the winds were variable from 320 to 020 at 21 knots gusting to 28 knots. I entered a 45-degree track to join the downwind for Runway 32. The airplane's crab angle was extreme, and while the airspeed showed 110 knots, our groundspeed was only about 85 knots. I listened to the weather again, and the wind was reported as being from 350 at 18 knots, gusting to 28 knots. When we lined up on final approach, it seemed to take us forever to get close to the runway because the headwind was so strong. I told Jodie that we might have to go around and approach the runway a couple times before I was comfortable landing, which seemed to make her a little nervous. Fortunately, though, the first approach worked beautifully and we landed gently. With the headwind, our flight time was about an hour and 40 minutes. We found out later that Nick and Meg had hit traffic again and it had taken them more than five hours to get home. Mr. Nelson is an intellectual property attorney at my firm in Washington, DC. His busy work and travel schedule frequently require flexible travel arrangements so as to minimize any lack of productivity. An important bar event required that he be in Charlottesville, Virginia, last Thursday. It so happened that I was scheduled also to attend the event. Always eager to please the rising stars and power brokers of my firm, I volunteered to fly Mr. Nelson to Charlottesville. It had been windy all day, so I postponed our departure until after 5 p.m. The wind still was 8 knots, gusting to 18 knots, but right down the runway. I did a thorough preflight inspection while Mr. Nelson walked around and looked at the planes, then we climbed in and took off. Once we were airborne, the ride was really smooth. 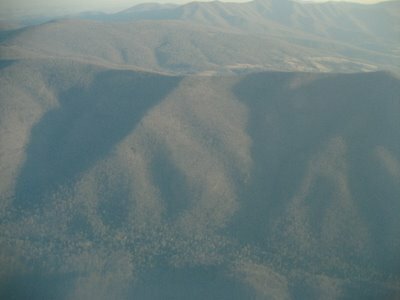 We hit a bit of mountain wave activity as we approached the Shenandoah Mountains. It wasn't bumpy at all - just a constant, steady descent for a while despite our efforts to climb. Mr. Nelson didn't even notice. We didn't have to cross any mountains, so I stayed as far from them as possible while still avoiding Class B airspace. It was a short flight, less than 45 minutes, but it was smooth and beautiful. 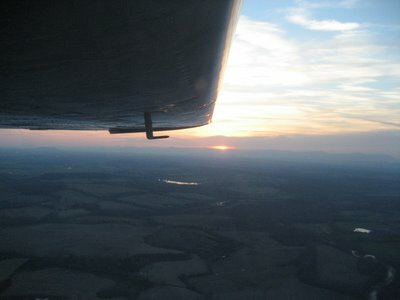 It got dark while we were flying, but the winds had cleared the air and we could see the Charlottesville airport from 20 miles away at our altitude of 4,500 feet. Our heading was south by southeast, and the Charlottesville tower cleared us to land straight in on Runway 21. The effect was that we had just about the longest final approach I've experienced -- we started a slow descent about 15 miles out that continued straight to the runway. Mr. Nelson flew the plane for most of the trip once we were outside the DC Air Defense Identification Zone. He first practiced holding altitude while we continued on course. We were in a hurry to arrive because of our late start, but we did take the time for him to turn to the left and then back on course to feel what it's like to turn the plane. (You can see his turns in the middle of the long straight leg to Charlottesville, above.) I have every confidence that Mr. Nelson would make a great pilot if he could find time in his demanding schedule to take lessons. The next day, Mr. Nelson had further engagements, so I flew back alone, stopping for fuel in Culpeper, Virginia. 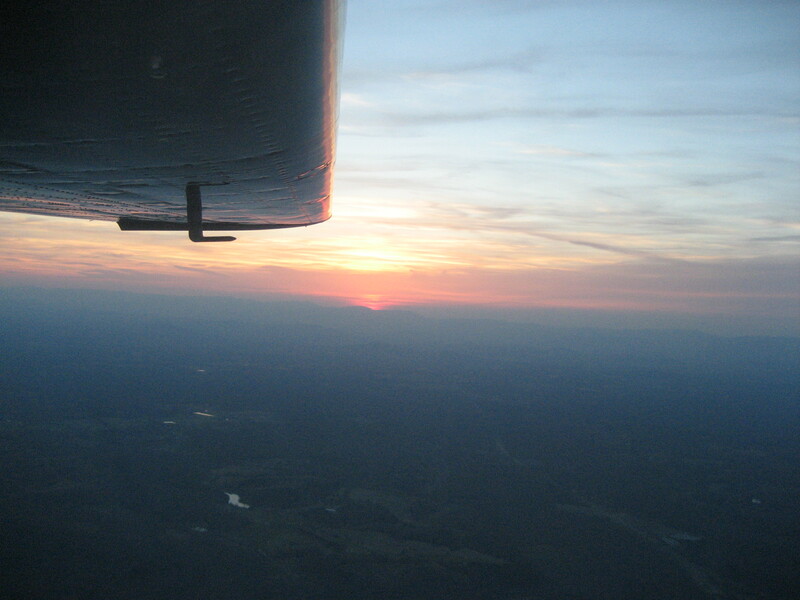 It was a smooth flight, and I was treated to a beautiful sunset. A good landing back at Gaithersburg, and another flying business trip was complete. I was playing around with Google Earth. With the "Terrain" feature turned on, I was able to create this view of the approach to the runway at Sky Bryce. In this "picture," the runway is in the top left corner, running at an angle toward the middle of the picture. This view is the view from final approach, before turning left to line up with the runway. The house with the bedroom windows I saw with Jodie is on the hill straight ahead. I lay in bed Sunday night and wondered if I was dreaming. Jodie and I had good reason to go to Knoxville this past weekend. But airfare was prohibitively expensive, so we thought we might fly. We drove to the airport on Saturday morning, but the weather was just not good for flying. Our route to Knoxville would take us along a mountain range for most of the 400 NM trip, and the winds were howling over those ridges at over 50 knots. Strong winds over mountain ridges cause things such as mountain waves and horizontal rotors that can make flying a small plane extremely uncomfortable. At the airport, I stuck my head into the office of a good flying mentor to confirm my judgment. That done, Jodie and I had breakfast and drove home. Sunday was forecast to be beautiful, and so it was. 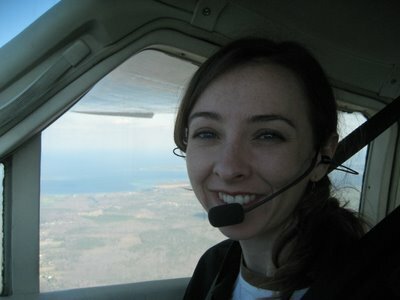 Around early afternoon, Jodie and I decided to go fly somewhere for lunch. 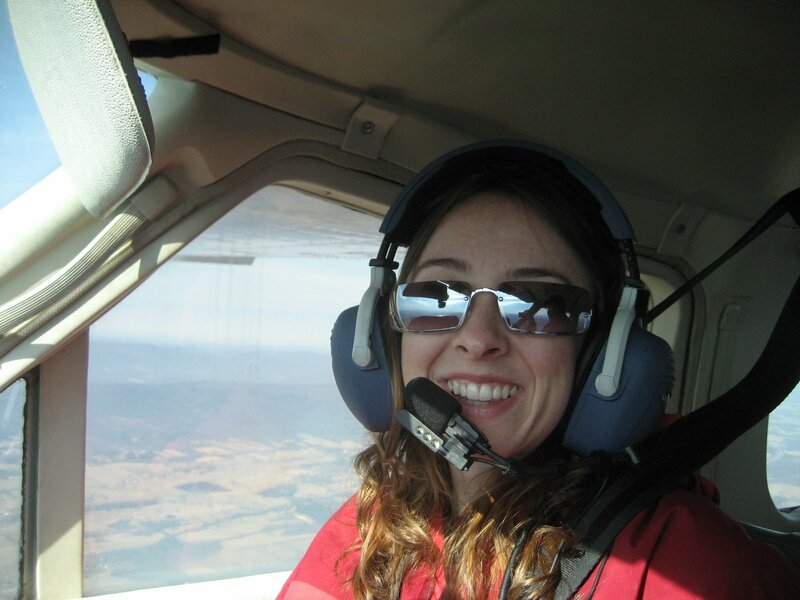 Recalling that my flying club had planned to go to an airstrip called Sky Bryce for a club trip, I confirmed the restaurant was open and we headed to the airport. 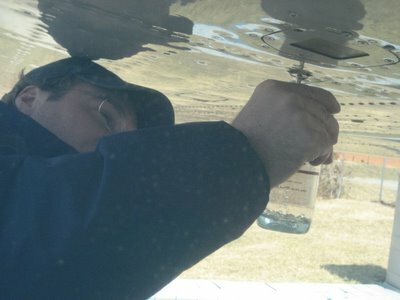 Jodie helped get the plane ready while I performed the preflight inspection, then occupied herself by taking many photographs of me performing my duties. We took off into the gorgeous blue sky and headed southwest. The visibility was excellent and we oohed and aahed as we made our way into the mountains. We saw this great series of bends in a river and took a picture. Later at the restaurant, we saw a photograph of this same piece of river, with the title, "The Seven Bends of the Shenandoah River." We were both having a great time and the air was so smooth, it felt like we were just hanging suspended in the Cardinal. Our first destination was the Sky Bryce airport in Bayse, Virginia. Sky Bryce is a small airstrip. It's not as short as Clearview, but it's only about half the length of Gaithersburg and narrower by 25 feet. More importantly, it is nestled in a small valley, up against higher ridges of the Blue Ridge Mountains. I tried to find a good photo or graphic to show how sheltered the airstrip is, but couldn't find a good one. This computer rendering from my flight planning software is the best I could do. I had overheard an experienced pilot and instructor say that when flying into Sky Bryce, if you're not looking in someone's bedroom window on final approach, then you're too high. I found that to be exactly true. I approached from the east, and decided to overfly the airport to take a look at the runway, and the windsock in particular. The windsock was barely moving, so I circled around to land. You can't see the airstrip until you're almost on top of it, so I didn't start descending early enough. By the time I saw the airstrip, I was too high. I used all the tricks in my book to get the plane down, but then I had too much airspeed. The plane still wanted to fly when we were halfway down the runway, so I pushed in the throttle and pointed the nose at the sky and we climbed back up for another attempt. This time around, I knew when to start descending and kept my airspeed nailed the whole way down. Final approach is a little funny, because you have to round a bend in the valley as you're descending, with trees on both sides. As we came around the last bend, I saw a house pass by Jodie's window on the right. I could see in someone's bedroom, so I knew I had the landing nailed! And I did. It was a great, smooth, short-field landing and the plane was nearly stopped within a third of the runway. We strolled across the parking lot to the ski lodge. Ski lodge? Oh, yes, I didn't mention that Sky Bryce is a ski resort, hence the mountains, etc. There's also a golf course and other amenities. We had a good lunch at the lodge, watching spring skiers come down the slopes. The little kids were our favorites. After splitting a slice of pecan pie and two cups of coffee, we headed back to the plane. I suggested we stop at an airport in Luray, Virginia, for some gas, and Jodie readily agreed. 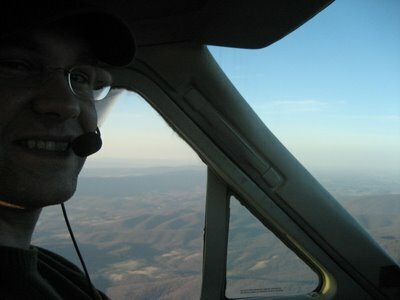 We took off from Sky Bryce (being careful NOT to peep in anyone's windows) and headed over the mountains to Luray. The straight-line distance on a map is only about 18 miles, but there are two mountain ridgelines with a valley in between in those 18 miles. It was gorgeous. From Sky Bryce on the west of a ridge to Luray on the east side of another ridge, we popped up to 4,000 feet then circled back down to land. Luray, Virginia, is home to Luray Caverns. I have never been to the caverns. As for Jodie and me on Sunday, it was about 5 p.m., too late to go to the caverns, so we had the plane fueled and I chatted with the nice people while Jodie lay back in the grass and soaked up the sunshine. We were completely relaxed. 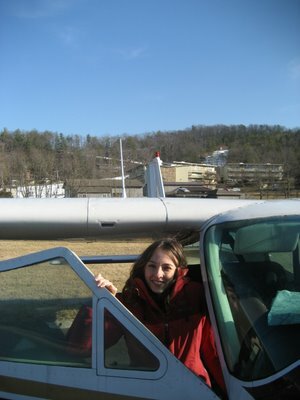 Luray was quiet and quaint, with planes tied down in tall grass and the mountains rising up above it to the west. Nothing seemed to be in a hurry, and us least of all. We waved to the one other pilot who was there as he lifted off the runway to fly home, then got back in the Cardinal to head home ourselves. We followed a line of mountains northeast toward Leesburg, Virginia, before turning east to Gaithersburg. The late sun cast long shadows in the valleys and I wondered aloud to Jodie if people in the valleys considered it to be nighttime. Even as we were still flying, I think we both appreciated what a special day we had experienced. The setting sun at our tail as we approached Gaithersburg made us smile, so I grabbed the camera to catch the moment. We flew into the traffic pattern at Gaithersburg and joined the downwind leg for Runway 32. 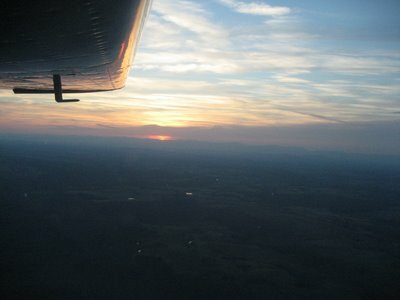 As we turned base and final, the sun set in one final, brilliant blaze and we glided down to land without even a bump. Jodie helped me secure the airplane and we drove home. Lying in bed Sunday night, I stared at the ceiling in stunned reverie. Did that day really happen? 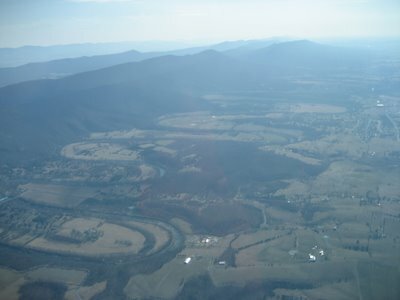 Were Jodie and I really soaring serenely above the mountains and fields of Virginia? In our days of constant striving for one thing or another, did we really spend one day completely in love with each other and the exact thing we were doing at that exact moment? Was I dreaming? I wasn't dreaming. It was just the magic of flying. Jodie got it on video.